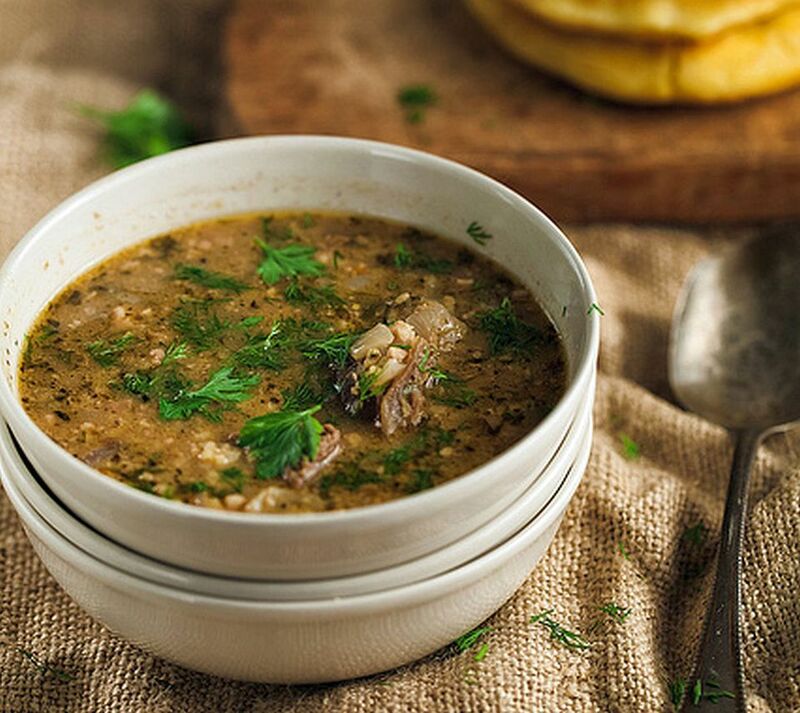 This Lamb and Rice Soup (Kharcho) is of Georgian origin, which is bordered by the Black Sea to the west, Russia to the north, Turkey and Armenia to the south, and Azerbaijan to the southeast. Georgia has a rich culinary tradition from which Russia has borrowed liberally. There are many variations of kharcho from family to family and region to region. What is unequivocal is the use of tklapi, a dried sour plum roll (like fruit leather) available at import shops. If you can't find it, modern cooks use tamarind paste (available at Indian grocers) or a lot of lemon juice. Dredge the lamb cubes in the flour. In a large saucepan or Dutch oven, melt the butter and brown the lamb cubes on all sides. Add the chopped onion, tomato paste, and garlic, and sauté 2 minutes, adding more butter, if necessary. Add the water or stock and 1 teaspoon optional salt. Bring to a boil, skimming any foam that rises to the surface, reduce heat and simmer, partially covered, for 1 1/2 hours. Add plum roll and rinsed and drained rice. Return to a boil, reduce heat and simmer, covered, for 20 minutes, stirring occasionally to prevent rice from sticking to the bottom of the pan. If soup becomes too thick, add more stock or water. Serve in heated bowls and garnish with chopped dill, if desired.